Ready to be surprised by a peony with a wild and quirky colour? The purple coloured Paeonia Louis van Houtte is what you’re looking for. Louis van Houtte is a full-flowered peony with purple petals. Dark stems and hard leaves are typical for this variety. Furthermore the flowers are modestly sized, about 8 cm wide on average. 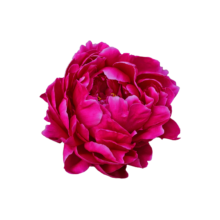 Louis van Houtte was bred in 1867 by the French breeder Calot, who oversaw the legendary peony collection of the Count of Cussy between 1850 and 1872. This collection contained more than a hundred different varieties of peonies with enabled Calot to breed a lot of new varieties. Some of them are still popular today; including Louis van Houtte. Other known varieties of Calot: Amabilis, Boule de Neige, Lady Anna, Duchesse de Nemours, Marie Lemoine, Pecher and Reine Hortense. But none of them have those quirky purple flowers that Louis van Houtte has! Never cut this peony to young, purple varieties have a hard time opening when cutted to tight. Also it is always a good idea to have some sugar in the water to give them some extra energy.